Vishnuvardhan to team up with Nayantara? In an exclusive interview with our Galatta correspondent, director Vishnuvardhan has conveyed his interest to do a woman-centric film. The hit-making director who has presented a string of action thrillers to Tamil Cinema, was asked if he would direct a women-centric film. Before even the question was completed, the director was all excited and gave a nod of acceptance. Any guesses on the actress's name for whom he would script such a movie for? It is none other than the Billa actress Nayantara. The director who has teamed up with the actress in two of his previous ventures - Billa and Arrambam said that he has all respect for the actress, both in personal and professional life. In fact, the director was running out of words to praise the actress. The director also added that he would love to introduce fresh talents as well, provided the script demands it. On the other hand, the director's upcoming release Yatchan starring Arya, Kreshna, Swathi Reddy and Deepa Sannidhi, has just 3 days to go for the release (September 11th). 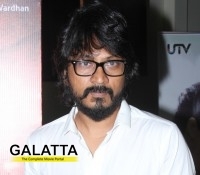 Stay tuned to Galatta.com for exclusive updates on the film! >>Like Thani Oruvan, So Yatchan! >>Two Yatchan releases for tomorrow! >>Huge screen count for Yatchan! >>Yatchan, sequel to Arinthum Ariyamalum? >> Ajith's Next With #Aaramabam Vishnuvardhan? >> Vishnuvardhan to team up with Nayantara?